The ability to read an ECG is one of the most crucial skills of any physician. Because the imedicalapps team felt it was so important, we reviewed a range of ECG apps to determine which one was the most useful. 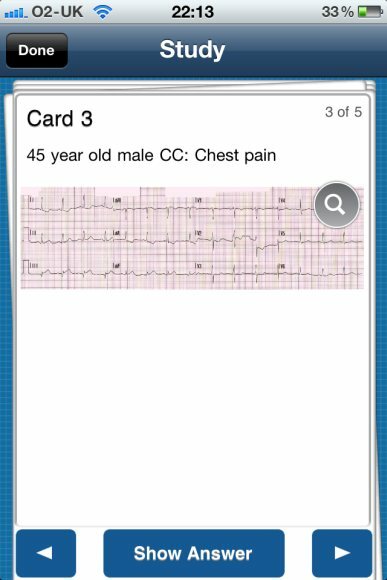 One of the areas we felt was important for an ECG app was to have a large number of samples so that different conditions could be seen. 12 Lead ECG Challenge is written by Tom Bouthillet (a popular ECG blogger over at ems12lead.com) and contains over 150 sample 12 lead ECGs. The premise of this app is simple. 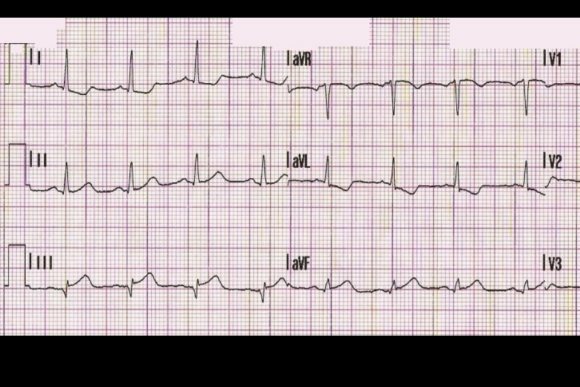 By turning ECG reading into a challenge, it hopes to develop the skills required to quickly and accurately diagnose potentially life threatening conditions. 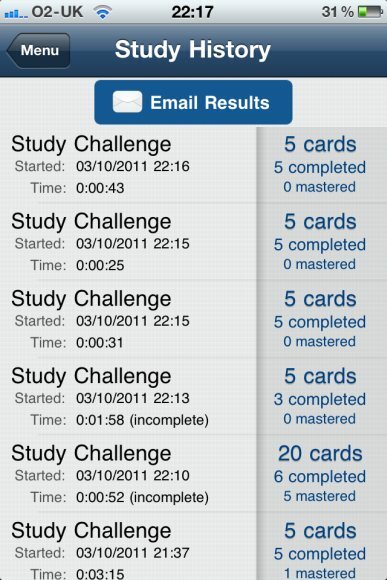 Opening the app presents the user with two main options: Challenge Me or 12 Lead Challenge. Selecting Challenge Me allows the user to complete a quiz consisting of 5,10 or 20 questions. 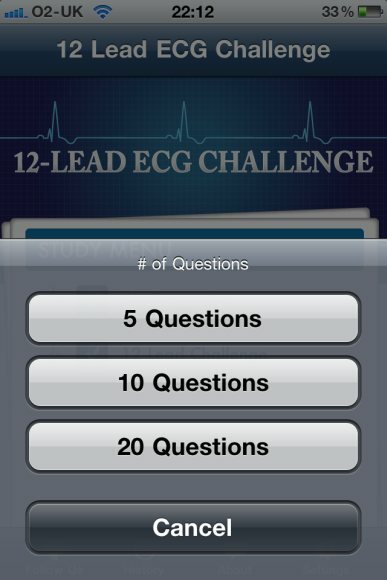 These are randomly selected from the question base, while 12 Lead Challenge tests the user on all 150 questions! Each question offers a (very) short background and then presents the user with the ECG which can be zoomed and manipulated using standard touch gestures. 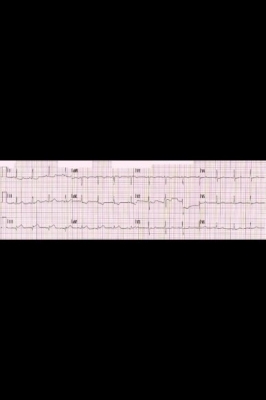 There are often hints for some of the more challenging cases. When you have a diagnosis, you can display the answer. 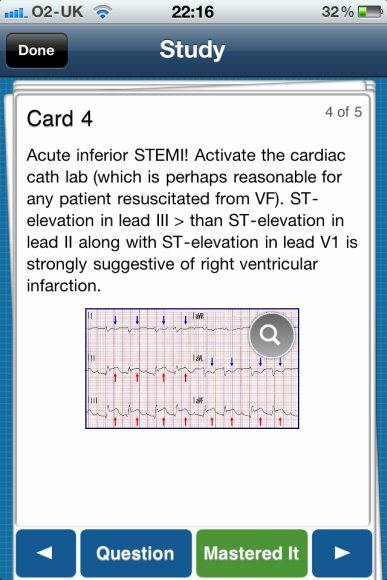 This is where 12 Lead ECG Challenge really comes onto its own amongst ECG apps. 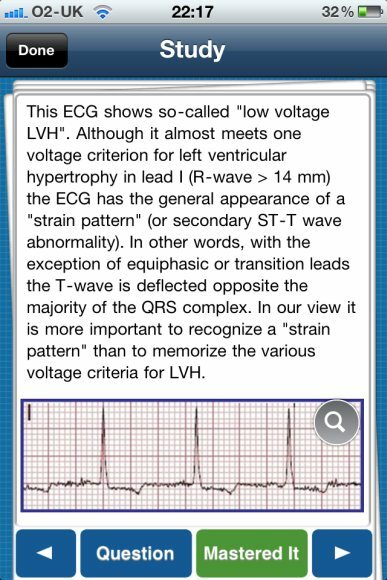 It displays a brief answer and importantly highlights the relevant sections on the ECG (see the following screenshots for examples). This feature significantly enhances the learning process and means this app is fantastic for pointing out exact abnormalities. Once an answer has been displayed, there is an option that says ‘mastered’. 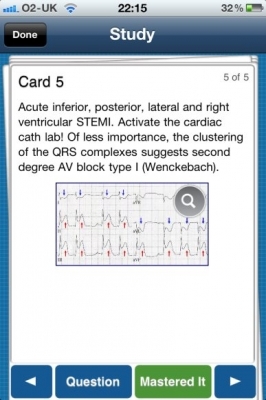 Pressing this option indicates that you successfully made the diagnosis and as a result, this card will no longer be displayed in a study session. 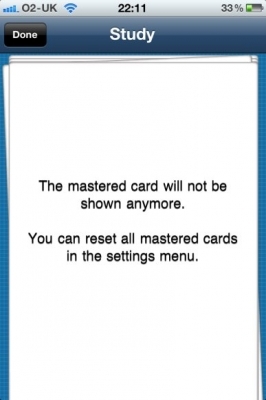 This means that over time the cards which are easy are removed and only the more challenging cases are left. 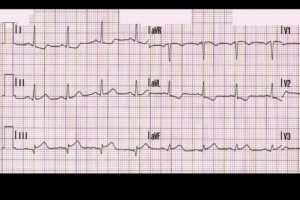 Reading the ECGs on an iPhone was not as challenging as initially expected, although the ample screen real estate of the iPad is well suited to this task. 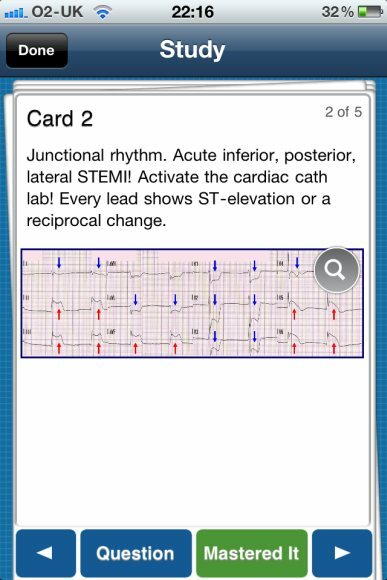 This app is very good overall but there are a couple of updates that I think would improve 12 Lead ECG Challenge. 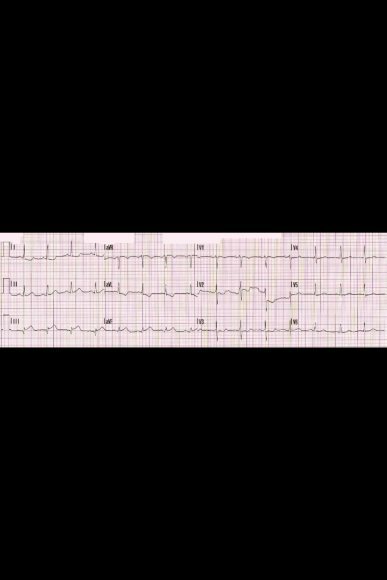 It would be nice to have a greater history to aid diagnosis (in reality, an ECG is part of a wider clinical picture from which a diagnosis is made). It would also be useful to include an option to say if you got a card correct or not with the ability to track the corresponding statistics. There is an option to track some statistics, however, it only tracks the studies attempted and the number of cards that have been mastered. 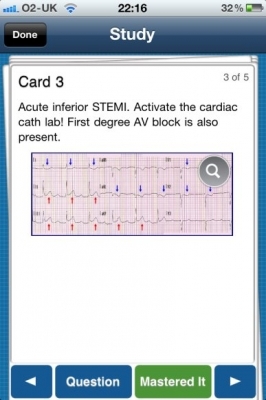 Finally, this app could be completed with a small section on common ECG abnormalities (ala ECG Guide or Instant ECG). 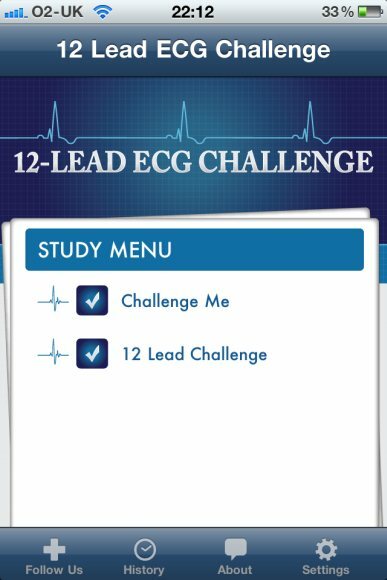 Despite these finer points, 12 Lead ECG Challenge is a fantastic app that will be of use to all healthcare professionals from student to resident and higher. 12 Lead ECG Challenge is an ideal app for testing oneself once the basics of reading ECGs are known. 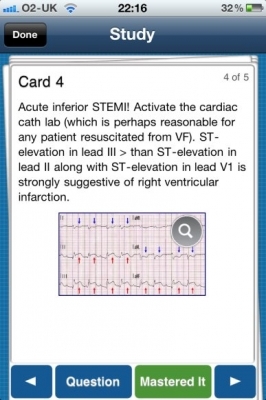 The highlighted answers illustrate abnormalities quickly and help develop ECG skills. 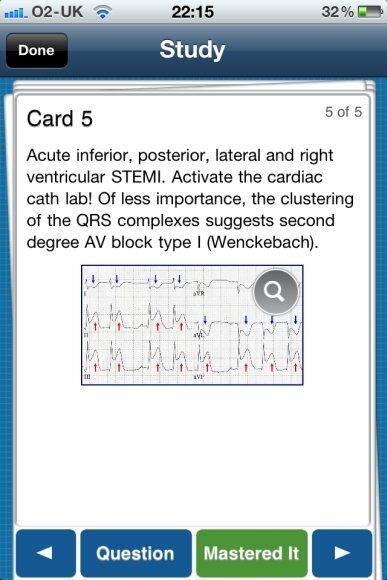 Overall this is a worthwhile purchase if you are looking for a range of ECG cases to practice reading on.